Driving up the Sheikh Zayed Road with the spectacular Emirates Towers coming into prominence on the right. The sun is shining and the sky is blue but then all of a sudden something catches the eye. A small speck – surely it’s a bird – comes hurtling off the top of the tallest tower plummeting towards the ground at 100 miles per hour, seemingly out of control. Imagine the horror when you realise that tiny spec is actually a human being; and then imagine the relief when you see a parachute unfurl just yards from the ground to break the fall. It is a moment that would stay with you for life, but one that is being experienced across the world as the adrenalin-fuelled - yet illegal - sport of BASE jumping spreads. There was a time when throwing yourself from a building was reserved for shirtless Wall Street bankers and members of the SAS attached to ropes but not anymore. BASE jumping has become the golden ‘challenge’ for thrill seekers looking for that ultimate rush. BASE jumping takes its name from the selection of structures that these seemingly insane people like to throw themselves from: B.A.S.E. – buildings, antennas, spans (or bridges, but BABE would sound a bit odd) and earth (or cliffs to be more precise). The ethos of the sport is simple: do not get killed and do not get caught. 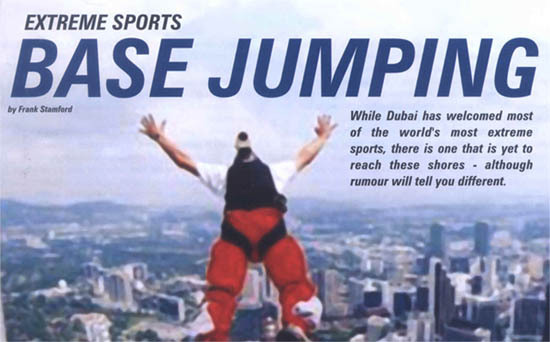 The official line is that this extreme sport is yet to make its way to the United Arab Emirates but the rumour mill is full of a story claiming that one young man has already taken the plunge. This, however, is strictly rumour and no confirmation is available. The basic score is to throw yourself from a great height and then open a parachute to slow your rapid descent to the floor. Some of the venues that have been conquered by jumpers in the past are the Hilton Hotel on Park Lane, Canary Wharf, Cheddar Gorge and even the inside of St Paul’s Cathedral. No-one is certain when the first BASE jump took place although it can be traced back to the late 1970’s. The world’s best BASE jumpers have become folklore heroes to an army of extreme sports fans and some of their feats have become legendary. The recent Hollywood blockbuster Triple X showed heart throb Vin Diesel BASE jump off a bridge in a senator’s car and Hollywood has also captured this sport before in movies like Drop Zone and Terminal Velocity. Powell may have escaped unhurt but the sport has claimed its fair share of victims. One of its most famous daredevils, Xavier Bongard, died during a BASE jump in Switzerland while one Swedish skydiver with 2800 jumps under her belt died on her first BASE jump off a 3,000ft Norwegian cliff after hitting a ledge. It is widely believed that she ignored advice from experienced BASE jumpers. Authorities the world over have been quick to condemn the sport and some participants have been treated harshly. Fines of up to $2000 have been handed out and equipment confiscated. One of the most tragic stories happened in 1998 when ‘professional’ BASE jumper Frank Gambalie successfully jumped off El Cap in Yosemite National Park in Arizona but found park rangers were waiting for him in the meadows. He tried to escape by swimming across a river but eventually drowned. Although it sounds like this ‘sport’ depends on nothing but the insanity of the person taking part, there is a great deal of skill involved. 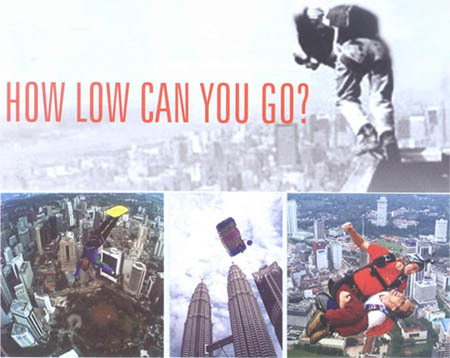 Experts say that first time BASE jumpers should have carried out at least 200 freefall skydives as all jumpers should be trained in freefall skills so that they can assume the correct body position when jumping. Flying a few feet in the wrong direction can put you in all sorts of trouble when jumping in confined areas. Top draw canopy skills are also required. The ability to turn and land in areas where there is not a lot of room for maneuver is no mean feat. Packing your chute is also an essential part of jumping. Reserve shoots are not really used when BASE jumping, so there is only one chance to get it right. By the time a BASE jump is completed there is more adrenalin in the veins than blood. People who have done it talk about being more sensitive to the environment around them and noticing much more of what is going on. Not surprising that a new found love of life is discovered having spent a mere 80 seconds in freefall leaving 10 seconds to pull the chute and break the fall. It is probably time for a change of underwear when you finally touch down on terra ferma! The sport has taken a grip world-wide as more and more daredevils look to push themselves to the brink. But a word of caution: throwing yourself off buildings is not something to be taken lightly. It appears that the majority of BASE jumpers are not just reckless individuals who jump off things without a care in the world for the safety of others or themselves. They take a great deal of time over planning and preparing for jumps and only people who are prepared properly should take part in this sport. American BASE jumpers have made several bids to be recognised as a legal sport. Three years ago, they struck a deal with park authorities to do a mass jump in front of an organised media without prosecution. It backfired though. Jan Davies, a veteran with more than 70 jumps over 16 years, was using a borrowed chute and gear that had a chord on the leg, unlike her chute which had the chord on the back. She used borrowed gear because she feared it would be confiscated by rangers. Unfortunately, she could not deploy the canopy and she died instantly. Her death worked against the sport and supported the view that it was dangerous. So while the UAE waits for its first BASE jumper, you can be rest assured that someone driving down that Sheikh Zayed Road will be eyeing up the Emirates Towers, and it won’t be to marvel at its architectural brilliance!